Since most businesses store troves of valuable assets at their commercial properties, keeping these properties secure from thieves, vandals, and other trespassers is a constant concern. However, businesses must also choose security measures that do not deter potential customers. How can businesses balance reliable security with curb appeal, while still protecting their bottom lines? Fortunately, wrought iron fencing provides a versatile solution for various types of commercial and industrial properties. Compared to other common fencing materials, wrought iron is highly durable—making it a formidable barrier against unauthorized entry. 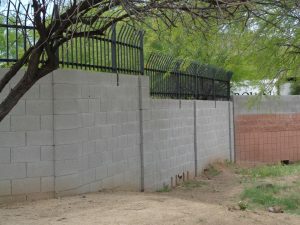 It cannot be easily damaged, and unlike chain-link and other types of fencing, it generally does not contain handholds or footholds that would allow a trespasser to climb the fence. Business owners may also add a wrought iron gate to maintain close control over who accesses the property. By enclosing their properties with sturdy wrought iron security fencing, businesses can enhance protection for their assets, buildings, employees, and customers. In addition to providing an effective security measure, wrought iron fencing improves the appearance of any property. With its naturally elegant aesthetic, wrought iron may be easily customized to suit different styles. At DCS Industries, we offer a variety of options—such as curving, powder coating, and electrostatic painting—to ensure that each wrought iron product we produce complements a property’s unique style. 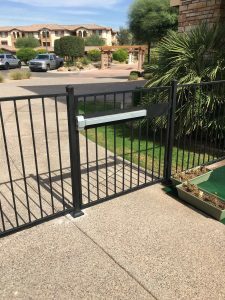 As a result, our wrought iron fences endow properties with a beautiful look that is inviting to customers, as opposed to the foreboding appearance of many other security fences. As an additional benefit for businesses seeking to protect their bottom lines as well as their properties, wrought iron delivers a strong return on investment. Due to wrought iron’s natural durability, it tends to stay in sound condition for many years. DCS Industries offers the option of galvanization, which further extends the life of the wrought iron. Our galvanized products carry a ten-year warranty and are sealed with a protective zinc coating to safeguard against rust. Therefore, choosing a stylish, galvanized wrought iron fence from DCS Industries will help businesses ensure security for their properties while enjoying an investment that will yield value for years to come. Is your commercial property safe from exterior threats? Contact DCS Industries today at 623-825-7700 to learn more about our custom security fencing solutions or to request a free quote!